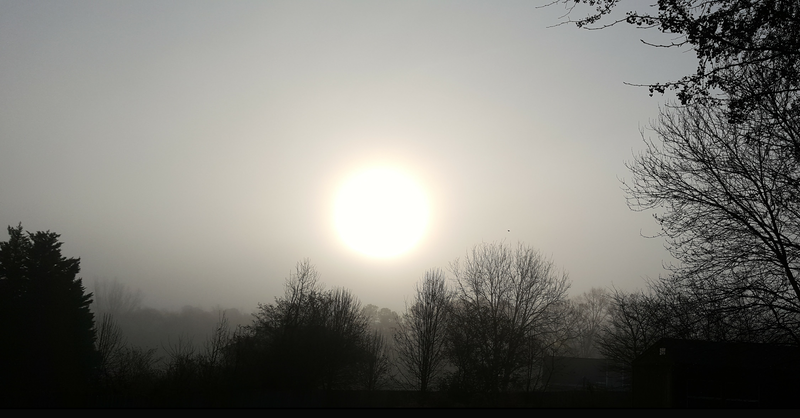 Hollow Night: how it all came to be this way for me. Home / Entertainment / Hollow Night: how it all came to be this way for me. Hollow Knight has taken me prisoner. 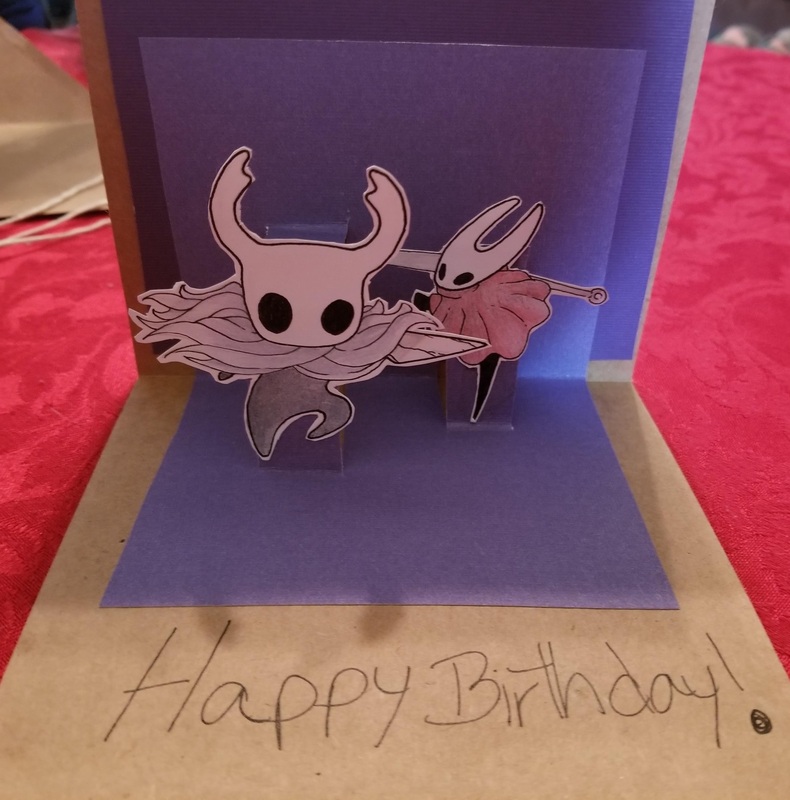 Birthday Pop-Up Card for my son that I made with my daughters artsy drawing of the two characters from Hollow Knight. On September 12th I was trying to come up with ideas for a card for the next day. I was drawing a blank. Then my daughter mentioned Hollow Knight, drawing something, and I could make a Pop-Up with it. It was more a joke, but not entirely. 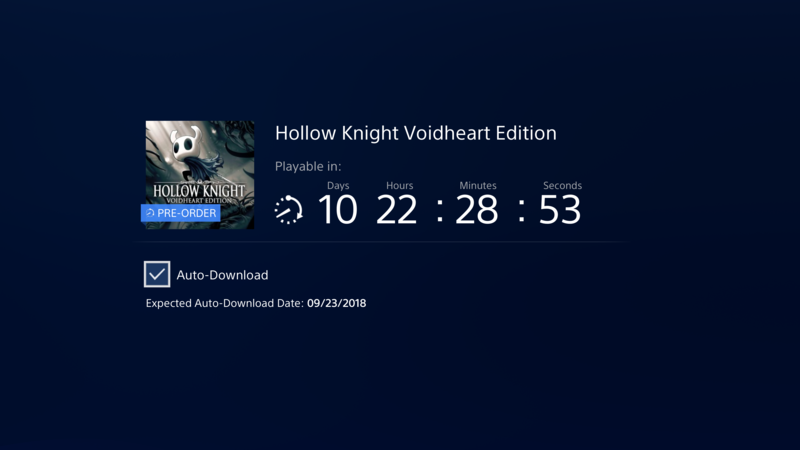 Hollow Knight had just be announced coming to console on September 25th, with pre-orders to start on PS4 on the 14th. She and my son talked about Hollow Knight here and there, and were interested in it, I knew the name, but didn’t really understand what it was. So about Pop-Up’s, “I can do that, all I have to do is look up some instructions.” I hadn’t made one in a long time, and I wanted to to do a decent job. In the next moments the idea for the card came into being and she agreed to draw something. I cut the figures out and put the card together. We chose the purple papers for the backdrop together. We were giddy over the results. I put it in the envelope, that Pop-Up card, after we fawned over it and snapped so many photos. Super excited for the night to be over so we could see him open the card! My other son was audibly impressed when he saw it. Priceless. It was well liked by the whole family. So basking in all that glory I looked up more about Hollow Knight the previous day and the day of the birthday. I was so hooked by the time I cut the figures out, really. I ended up getting the main soundtrack on Humble Bundle (it’s not in Google Play, and I prefer to own things I really like so…) yesterday. This morning, just after 3am I started checking PSN Store for the pre-order, finally getting that nearly 12 hours later. I know the game is going to torture me once I have it to play. I look forward to the misery.